The Monster Double Bean Bag is a big friendly giant of a bean bag, perfect for relaxing and snuggling into after a long day. As a double seater it comfortably sits two adults side-by-side. Made up of six panels, double stitched together for added strength, the durable faux leather bean bag forms an oval shape when two adults sit together and is a great alternative to a sofa in an informal living room / TV room. Price £139.99! Order yours today! The Lounge Pug Mammoth size bean bag is the ultimate in retro chic for any chill out living space and is perfect for anyone who likes to curl up in comfort. In fact, it's so big that two can fit on it with ease. Made in the UK, this stunning bean bag is of a very high quality with tough cord upholstery (very soft) and extra strong stitching. Price includes polystyrene filling and stain guard finish. Crafted in velvety soft and uniquely textured jumbo cord, this extra large dome shaped beanbag is the ultimate in luxury and style. The innovative panelling design makes it instantly comfortable when you sit in it, moulding perfectly around the shape of your body and creating support for your arms. Available in two neutral tones; a natural colour and also a darker taupe, it makes a lovely addition to any living room. A matching footstool is also available separately if required. These luxurious extra large bean bags are made from hand-picked pure Australian and New Zealand curly pearl sheepskin, renowned for its incredibly durable wool fibres and natural heat regulating and hypoallergenic properties. Wonderfully comfortable and totally portable, this is the most luxurious, most supportive "armchair" you'll ever sit in and perfect for curling up in with a book or DVD. The Monster Double Bean Bag is a truly gigantic and monster XXXL sized bean bag built for two people to snuggle into! Great for watching films, listening to music or reading, this huge faux leather bean bag is available in three subtle colours. Enjoy cosy nights in with someone you enjoy being close to. 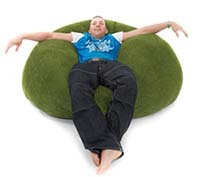 The bean bag is oval shaped and made from six panels. 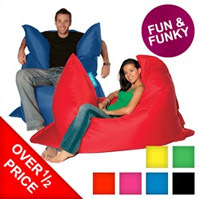 Comfortable, stylish, contemporary giant sized bean bags available in a range of colours, suitable for use indoors or outdoors and now available at half price. 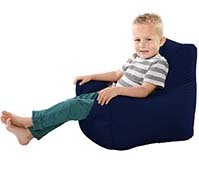 These stylish bean bags also come in junior beanbag size specially for kids. Just like the adult version only slightly smaller. Whether you're a sharer or just like a giant nest for your derriere, the Goliath beanbag is perfect as it is truly enormous. With a massive 20 cu ft capacity, it's the ultimate in big bean bags. Made from a hardwearing and stunning jumbo cord fabric (many designer sofas use this same fabric, so you could get a beanbag to match your sofa), it's lovely and soft to the touch and will keep you warm and comfy for hours! 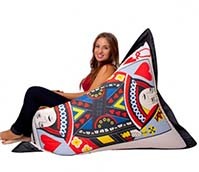 The Queen of Hearts Slouch Sack bean bag is a designer bean bag printed with the infamous Queen of Hearts playing card. This high quality product is printed using the best quality machines and ink to produce an unbeatable finish on the design and is the perfect bean bag for a games room, themed party or just for chilling out on in your bedroom. 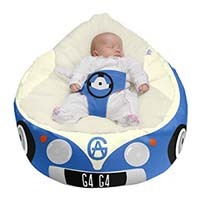 The iconic Campervan is brought to life in this luxury Gaga© Baby Bean bag. 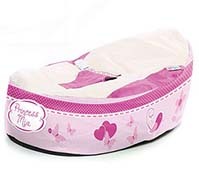 Featuring super soft fabric to the seating area, your baby will be lounging in ultimate comfort. The seating area is backed with a waterproof barrier so any little accidents do not damage any of the beanbag and the bean bag is completed with an anti-slip and moisture resistant base. An adjustable harness keeps baby in a secure and comfortable position and is also easYfill compatible which makes washing a quick and simple job! Ideal as a gift, the bean bag can even be personalised (max of 8 characters). The Squashy Squarbie© giant beanbag is one of rucomfy's best selling beanbags and it's been slashed in price in the rucomfy summer extravaganza. Made in a strong and versatile material, it can be used equally well both indoors and outdoors and is available in a great range of colours. 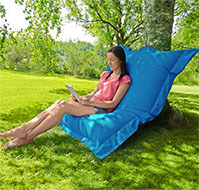 It can be positioned in a number of ways for optimum comfort and is great for sunbathing in the garden on a sunny day or chilling out at a barbecue. 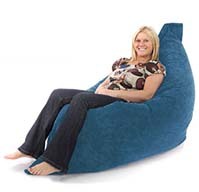 The OnePiece bean bag - the ultimate in relaxation? OnePiece took the world by storm with their comfy, snuggly leisurewear that became an instant favourite with everyone. So why not indulge even further with the OnePiece Branded Bean Bag - teamed up with a onesie it becomes the ultimate in relaxation. Perfect for informal seating, these superstrong beanbags are ideal for lounging about on, watching TV or for gaming in comfort and would be a welcome addition to any teenagers bedroom. They're available in a rainbow of colours, and a number of designs and are even water resistant so can be used outdoors or indoors. 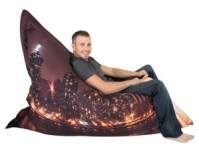 The New York Beanbag® features one of the most iconic cities and the Manhattan Skyline at night looks great on this designer bean bag. 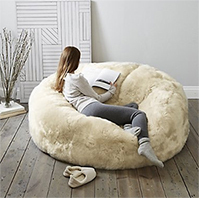 This unique and modern bean bag is designed in hard-wearing, water-resistant material, and would be ideal for furnishing a loft or attic space. The NY Sky beanbag would also be perfect for enjoying down-time in your city pad. 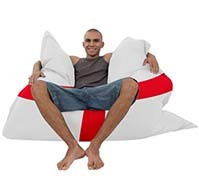 What could be more perfect than sitting watching sport in a super comfortable patriotic England flag bean bag. Digitally printed in vibrant, durable colours, the bean bag is machine washable. It moulds to fit your body shape, can be positioned in a number of ways as a beanbag chair, lounger, recliner or even as a large floor cushion and is available in a choice of three different sizes. Bean bags are perfect for nursery groups, playgroups and informal meeting places, but not everyone has the same size derriere. No problem, thanks to rucomfy who have a great choice of playtime beanbags which come in a range of sizes from extra small (1-3 cu.ft.) up to XXL (16-19cu.ft). If your toddler is a chip off the old block, then they'll love having their very own armchair, just like yours. This toddler sized beanbag armchair, complete with complementary piping detail around the front arms, is perfect for watching TV, playtime or for relaxing in, and is suitable for tots up to five years old. The bean bag is made in durable, wipe cleanable, washable fabric. All little chicks need a nesting place, a place to feel comfortable, warm and secure . 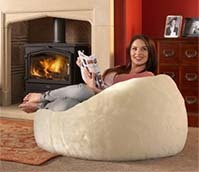 . . and what better place to roost than in the Chandler the Chick Bean Bag. Made in the UK, the strong yet soft fabric is digitally printed on all sides to bring Chandler to life and the bag can be washed in the washing machine. 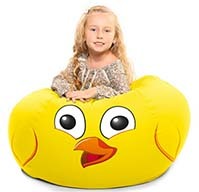 This fabulous chick shaped beanbag is both fun and practical and it is available in three different sizes so there's one to suit everybody! If you're looking for a throne suitable for your little princess, then the Little Pink Princess Gaga© Baby Beanbag is perfect. The super soft fabric on the seating area is backed with a waterproof barrier and the bean bag has an anti-slip and moisture resistant base. The bag is also easYfill compatible which makes washing a quick and simple job! Baby will be cosy and comfortable and an adjustable harness keeps her in a secure and comfortable position. Part of the new designer ICON™ bean bag range, the red, white and blue Union Jack design is the ultimate in patriotic beanbags! This distressed look, shabby chic effect designer bean bag has a Union Jack vintage design on one side and a plain reverse. Multi-functional, it can be positioned in over four ways and is made from hard wearing water-resistant fabric, with an easy wipe down finish. 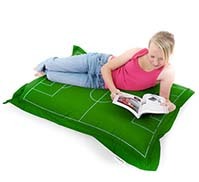 Green in colour with white line markings, the Football Pitch Bean Bag has been designed to look like a football pitch. Perfect for relaxing on, it can be positioned in a number of ways and is ideal for watching your favourite team on TV. Available in three different sizes so there's one to suit everybody! Offering the ultimate in both design and comfort, the XXL Real Leather Bean Bag is a huge adult sized chair, filled with beans to offer excellent back and neck support. Ideal for relaxing on or for gaming, the wide and deep bucket seat is a great feature, giving you more comfort and all round support and the soft supple leather design sets this recliner apart from other similar chairs. 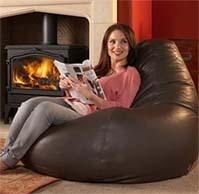 The Solo Lounger Large Beanbag is the perfect beanbag for indulging in 'you' time. Shaped to create supportive head and foot rests that will ensure you're completely comfortable, it's ideal for relaxing on, reading or watching TV. The Trend™ fabric is strong, wipe cleanable, durable and washable and there's a massive choice of 26 different colours to choose from so it'll fit into any decor scheme. 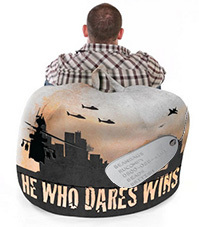 The "He Who Dares" ® Beanbag is a must have for any gamer and comes in a choice of five sizes (S, M L, XL and XXL - ranging from 3cu feet up to a massive 11cu feet). Part of the 360° printed bean bag range, the Bean Bag is printed with an intense modern warfare cascading over a dusk city battleground and has a dog tag which is customisable for the lucky owner for FREE (you get five lines, 15 characters per line and it's completely up to you how you do it). Perfect for all ages, it even features a handy little handle for ease of transportation. 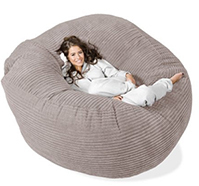 Wrap yourself up in the warmth of a luxurious faux fur bean bag and experience snuggly comfort first hand. This XL designer bean bag chair, has a nine panel design and is available in five stylish colours. 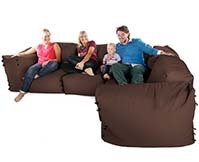 Designed for lounging on, it's perfect for relaxing after work, catching up with your friends and watching films - it is so comfortable you won’t want to ever get out of it! 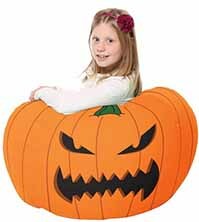 If you're looking for the ideal seating for a Halloween party or monster theme bedroom, then you'll love the great range of monster theme bean bags on offer, including this scary pumpkin bean bag. Great fun, excellent quality and practical, the Pumpkin Bean Bag is available in three different sizes and is perfect for children to relax on at story time, watch TV or play games. It's digitally printed on all sides, machine washable and can also be personalised with the owners name. Enjoy pure luxury at a fraction of the cost with this modular bean bag seating arrangement. Perfect for a family room, playroom or informal living room, the seven individual pieces (four chairs and three arms) are attractively joined together with chunky plastic buckles and can be expanded simply by adding more chairs, pouffes or arm pieces. The possibilites are endless. Available in strong, wipe cleanable, durable, washable fabric, in a choice of 24 colours, this L-shaped sofa is £499.99 online. 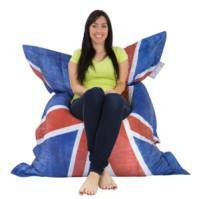 If you're the king or queen of the house, you'll love this patriotic Union Jack bean bag. Digitally printed in vibrant, durable colours, the bean bag is machine washable and is perfect for bedrooms, playrooms or living rooms. It is available in a choice of three different sizes to fit all royal backsides. 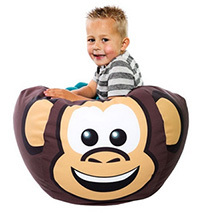 Here's the ideal beanbag for your little monkey. The Marvin the Monkey shaped beanbag is great fun for your children and perfect as a unique and practical gift! This versatile animal shaped bean bag is machine washable and is perfect for kids’ bedrooms, playrooms or living rooms. Soft and cuddly, his features are digitally printed on all sides and he is available in three different sizes (smallest pictured). The Goliath beanbag is truly huge, so large in fact that it is suitable for two to get comfy on. 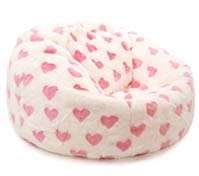 This luxurious bean bag is crafted from a hardwearing and durable faux fur which is also lovely and soft to the touch and will keep you warm and comfy for hours! The bag comes in a choice of three animal print finishes - leopard, zebra and giraffe. 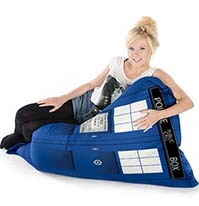 This Tardis inspired beanbag is ideal for any fan of Doctor Who. Quality printed with the iconic blue British police phone box, the underside if this Squashy Squarbie bean bag is complimented by a bold colour to match. It is available in three different sizes - junior 125cm x 100cm, large 140cm x 110cm and giant 170cm x 130cm and is perfect to relax in as it moulds to fit your body shape. Even better it can also be personalised with your choice of word / name (up to 8 characters). 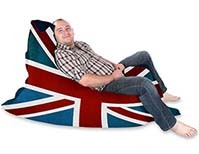 The piggy bean bag from Made is available in a rainbow of colours but if we had to pick a favourite it would be this gorgeous patriotic Union Jack bean bag. The giant piggy has been featured in Country Life and is ideal for watching TV, gaming or relaxing with a book. It can even be used outdoors as the material is durable and water resistant - but not to be left outside. With a handle for easy carrying. How many cubic feet of polystyrene balls will you need? As a rough guide, a 10 cubic feet bag will fill an empty medium to large beanbag. 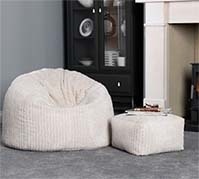 4-6 cubic feet will fill a new small beanbag or breathe new life into a medium to large beanbag with squashed balls.